Will Election Unite Ukraine? Dozens Killed in Airport Battle as President-Elect Vows Russia Talks | Democracy Now! an editor at Kyiv Post, who has been based in Ukraine for four years. professor of history at Yale University and author of Bloodlands: Europe Between Hitler and Stalin. His latest article for The New York Review of Books is “Ukraine: The Edge of Democracy.” He just returned this weekend from Kiev. served as U.S. ambassador to Moscow from 1987 to 1991. He is the author of several books: Superpower Illusions, Autopsy on an Empire and Reagan and Gorbachev: How the Cold War Ended. AARON MATÉ: Dozens of pro-Russian rebels have reportedly died in fierce fighting at the airport in the eastern Ukrainian city of Donetsk. The rebels seized the airport Monday morning. The Ukrainian government responded with force, launching air strikes, then paratroopers. The fighting began just hours after pro-European billionaire Petro Poroshenko won Ukraine’s first presidential election since the ouster of Viktor Yanukovych in February. Poroshenko took about 55 percent of the vote, enough to avoid a runoff. Polling stations never opened in parts of eastern Ukraine, where pro-Russian rebels have formed a self-proclaimed people’s republic. AMY GOODMAN: After his election, Petro Poroshenko said he was ready to negotiate with Russian President Vladimir Putin, but he ruled out any talks with pro-Russian rebels in eastern Ukraine. To talk more about Ukraine, we go first to Donetsk. Christopher Miller is an editor at Kyiv Post. He’s been based in Ukraine for four years. Talk about the results of the election and who the man is who won. CHRISTOPHER MILLER: The results of the election were Poroshenko winning by a landslide, and with more than—much more than 50 percent of the vote. However, that percentage in Donetsk region, specifically, was much lower. The turnout here was about 15 percent. I did speak with some people who were able to vote, not in Donetsk city proper, but in a western city here called Krasnoarmeysk. Some of them voted for Poroshenko, they said, because they had no other choice. They had no one who represented their views in the region. Others voted—said they voted for the former Party of Regions member Sergiy Tigipko. But there is very little support for Poroshenko in Donetsk, and, you know, more than 80 percent of the population was disenfranchised here. AMY GOODMAN: You are right near the airport, Christopher. Can you talk about what’s happening there right now? CHRISTOPHER MILLER: Yeah, I’m several hundred meters from the airport, as close as I can get right now. There’s about six dump trucks full of dirt. They’re being moved into the street and used as barricades. There are several hundred tires stacked up in front of them, the sort of first line of the barricade, and everything is wrapped in razor wire. There’s about 30 armed rebels here, several with anti-tank weapons rigged over their shoulders, all with Kalashnikovs and pistols tucked into their flak jackets. It’s a pretty tense scene. There are some locals standing by and about a dozen journalists, as well. We’re not sure exactly what’s going to happen here. We haven’t heard gunfire for several hours, but there was several bursts of it earlier this morning. AARON MATÉ: And, Christopher Miller, the new president, the president-elect, Poroshenko, has promised to negotiate with the rebels, but does this latest flareup of violence—does it portend a wider conflict? CHRISTOPHER MILLER: It’s really hard to say. Poroshenko obviously hasn’t sworn in yet, and he might be involved in discussions regarding the anti-terror operation that’s being carried out here, but, you know, the orders are still coming down from the interim government and interim president. You know, he said that he is planning on coming out east. It’s going to be difficult to get out here, obviously, with the airport closed, train traffic in and out, and barricades erected all around the region. But I might—I might have to go in a moment. Some people are—some people are moving. And I apologize. AMY GOODMAN: That’s OK, Christopher. Very quickly, how many people have been killed where you are at the airport? CHRISTOPHER MILLER: Around the airport area, after my visit to the morgue about an hour ago, 33 people had been identified as pro-Russian rebels that fought with Ukrainian forces yesterday. They were heaped into a pile at the morgue that was being guarded by several—several other rebels. The lead investigator there said that several of them had been killed by Kalashnikov bullets. One man was seriously mangled. His left leg was missing and his arms broken from some sort of blast. Other reports from the Donetsk mayor have said 40, possibly 43; two doctors I spoke to said 45 and 43 rebels have been killed. Both of them and the lead investigator confirmed with me that two civilians were caught in the crossfire—one man and one woman—and both died. AMY GOODMAN: And finally, the significance of Donetsk in the struggle, and if you think Ukraine could divide? You’re in—of course, right in Donetsk, which is in eastern Ukraine. CHRISTOPHER MILLER: It’s hard to say. It does seem as though—as tense as it is, that the Ukrainian troops have the upper hand. Most of the rebels fled the central administration building that they’ve been holed up in for more than a month last night, including the separatist leader, Denis Pushilin. And the Ukrainian military has taken control back from the rebels of the airport here. Certainly, they recognize the significance and importance of the airport here and, you know, don’t want to lose it. But it seems as though the momentum is in their favor. I guess we’ll see how today plays out and if they can remain in control here. AMY GOODMAN: Well, Christopher, stay safe. Christopher Miller, editor at Kyiv Post, he has been based in Ukraine for four years. When we come back from break, we’ll have a discussion about what’s happening overall in Ukraine, and then we’ll be talking to Rebecca Solnit about the massacre in Santa Barbara. This is Democracy Now! We’ll be back in a minute. AARON MATÉ: Well, dozens of pro-Russian rebels have died in the fighting in Ukraine, and we’re going to go now to talking about the elections. On Sunday, Ukraine’s newly elected president, Petro Poroshenko, said he was ready to negotiate with Russian President Vladimir Putin, but he ruled out any talks with pro-Russian rebels in eastern Ukraine. PRESIDENT-ELECT PETRO POROSHENKO: They just murder. They’re just bandits. They’re just a killer. They’re just a terrorist. That’s the case. And if you expected that I will find out the support of these people, no way, no chance. In no civilized country of the world, nobody have a negotiation with a terrorist. We are a civilized country. And we will, again, fight for the trust of the people of Donbass. We will propose the amnesty for those who can accept disarmed and not directly involved in the crimes, not only in the killing of the people. And we will defend and clean and bring the peace in the Donbass, including the fighting against terror. This is the—one of the main function of the state, to defend the people. AMY GOODMAN: On Saturday, ahead of the Ukrainian election, Russian President Vladimir Putin said Russia would accept the outcome of the vote. PRESIDENT VLADIMIR PUTIN: [translated] We will unconditionally respect the choice of the Ukrainian people, and we’ll work with the authorities that are being formed based on this election. AMY GOODMAN: To talk more about Ukraine, we’re joined by Jack Matlock. He served as U.S. ambassador to Moscow from '87 to ’91. 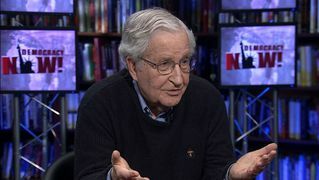 He's—welcome to Democracy Now!, joining us from Princeton. Talk about the significance of these elections and the man who won, Ambassador Matlock, the billionaire chocolate manufacturer. JACK MATLOCK: Well, the elections are obviously extremely important, the fact that so many people came out in most of the country and the fact that the decision was a clear-cut one. In the past, Ukrainian elections have been very closely balanced, with a very slight majority taking all the power. Now, the country is obviously still very divided, and it’s most unfortunate that those on the extreme east, particularly in Donetsk, for the most part didn’t have the chance to vote. Now, the president-elect, Mr. Poroshenko, is probably the best of the candidates in a position to begin to re-unify the country and to negotiate with the Russians. I think he has to do two things before he can address the deeper problems that Ukraine has. One thing, he has to unify the country in the sense that the Russian-speaking population of the east feel that they are part of the same country, and at the same time he has to satisfy Russia that his government is not going to be rabidly anti-Russian and a security challenge for them. I do think that he should be well positioned to talk to them. He has business interests in Russia. Of course, he has been in the government of the party that dominated in the east, so that it would seem that he is the best of the current leaders to lead them into—or out of some of their current problems. AARON MATÉ: Well, let’s hear more from the president-elect, Petro Poroshenko. After winning Sunday’s election, he said Russia’s involvement is crucial to resolving the crisis. PRESIDENT-ELECT PETRO POROSHENKO: Russia is our biggest neighbor. And because of the fact that they’re stopping the war and bringing the peace to the whole Ukraine and bringing stability on the eastern part of Ukraine, that would be impossible without participation of Russian representative, most probably. The meeting with the Russian leadership will certainly take place in the first half of June. AARON MATÉ: Ambassador Matlock, what are the grievances of the rebels in the east, and what can Poroshenko do to address them? JACK MATLOCK: Well, the grievances of the Russian-speaking people in the east—I don’t know about the rebels; I think they’re a bunch of hoodlums and are—you know, are simply seeking power for the sake of it and to loot and so on. But the people as a whole, I want to feel that they can be loyal, first-class Ukrainians and still live in a Russian-language cultural world. Russian is their first language, and they feel that the governments that have come from the West have tried to force upon them Ukrainian as a language that—not exclusive language, but one that has precedence over the others. This is a highly emotional issue. Now—and I think one of the big mistakes that the government made just after the overthrow of Yanukovych, there was a vote to make Ukraine the only official language. Now, that was reversed by the acting president, but still it sent shockwaves, I think, through the Russian-speaking eastern regions. There are other issues, as well. The economies are quite different in the basis. The eastern—the economy in the east is much more dependent upon Russia for markets and much more vulnerable to Russian manipulation. But basically, I think what the people in the east want, most of whom do feel that they’re loyal Ukrainians, most of them don’t want to be in the Russian Federation, but they do want respect. And I think that the new government must lead them to a sense of nationality, a sense of national unity, not based entirely on language but that includes Russian as well as Ukrainian. AMY GOODMAN: In addition to Ambassador Matlock, we’re joined by Timothy Snyder in Vienna, Austria. He’s a professor of history at Yale University, author of Bloodlands: Europe Between Hitler and Stalin. And his latest piece for The New York Review of Books is headlined “Ukraine: The Edge of Democracy.” He’s just returned from a weekend in Kiev. Professor Snyder, thanks also for joining us. Can you talk about who Poroshenko is, his history and his significance as the now president-elect of Ukraine? TIMOTHY SNYDER: Poroshenko is a good example of where Ukrainian politics stands now. What we saw in Ukraine in the early part of this year was a revolution, which was essentially from the left, a revolution against an authoritarian regime which had done away with basic rights, which was kleptocratic and which embodied the main complaint that Ukrainians, east and west, north and south, have, which is corruption. That revolution was essentially stopped halfway. It was stopped halfway as a result of the Russian intervention and the Russian invasion and annexation of Crimea, so that what you have now is a kind of compromise between new elites an old elites. Poroshenko is right there in the middle. He is—he is not someone new. He is someone who has served in important functions in governments over the course of the last decade. At the same time, he was someone who was on the Maidan, who rather prominently himself took part of the revolution. So, he’s somewhere in between. I mean, he’s someone who’s made an awful lot of money, and yet he’s also someone who stood by the people who were trying to change things for the better. With regard to your previous question, it’s interesting to note that Poroshenko, like the other major presidential candidate, for that matter, is a native speaker of Russian. He’s from—he’s from near the southeast. And like most Ukrainian politicians, he’s perfectly capable of using one language or the other depending upon the circumstances. AMY GOODMAN: And how he’s viewed in the east and also in the west, as well as by President Putin, Professor Snyder? TIMOTHY SNYDER: Well, look, the important thing about the election that just happened is that people went en masse to vote. I think the main idea that people had voting for Poroshenko was that he was the best of the available alternatives. Poroshenko is not someone who’s regarded as some kind of hotheaded patriot from the West. He’s not someone who is regarded as, you know, some kind of radical. He’s seen by pretty much everybody for what he is: a centrist. The crucial thing about Poroshenko is that he was the only candidate who had the necessaries to get elected in the first round. He had backing from all over the country. In fact, even in the southeast, insofar as we have electoral returns from there, he was the candidate who was winning. And he also had a reputation which crossed the divide between pro-Maidan and anti-Maidan. How is he seen in Russia is anyone’s guess. I’m not sure they’ve decided that themselves. But he has spoken to Putin in the past, and I think there’s no particular reason to think that people won’t—people won’t speak to him in the future. But, I mean, at the moment, of course, what he represents, above all, is the outcome of a very successful presidential election in which more than 60 percent of the people came out to vote. And I think, frankly, it was the voting itself, more than Poroshenko, which was the crucial thing to most Ukrainians. I think the voting itself is more the success. And now, you know, Ukrainians, like you and me, will have to wait and see whether this man turns out to be the oligarch and the traditional elite that he’s been in the past or turns out to be the person who cares about the rule of law and the Western orientation for Ukraine, as he’s promised in his electoral campaign. AARON MATÉ: And, Professor Snyder, we hear a lot about nationalism—people aligned with Ukraine, people aligned with Russia. But are there social and economic concerns, those that underpinned the revolution at the get-go? Can those concerns help unite west and east? TIMOTHY SNYDER: That’s an absolutely great question, because we have, for the last several months, been basically experiencing Ukraine within a kind of alternative reality in which the only issues were cultural ones, whereas in fact the cultural issues are, in my opinion, at least, not that important. The main issue in Ukrainian politics—and this is true of the people who are dissatisfied in Kiev, as well as the people who are dissatisfied in the southeast, in Donetsk, in Luhansk—is corruption and the absence of the rule of law. Nationalism is just not that important. I mean, there is an ethnic nationalist fringe in the west and the center, just as there is a Russian nationalist fringe in the southeast. Those people numerically do not amount to very much. As we just saw in this presidential election, the two nationalist candidates came in dead last. They polled around 1 percent. They were actually beaten—they were beaten by everybody else, but they were also beaten by the Jewish candidate. So, support for the far right and for Ukrainian nationalism in Ukraine is close to zero, much lower than in pretty much any other European country you would want to name. So, that’s not the real issue. That’s a distraction. I think it would be good to get that out of our minds and realize that the basic issue is how to install the rule of law in Ukraine. That’s the thing that Poroshenko is going to be tested on, and that’s the thing that Yanukovych, before him, failed on. And I think if the new government can phrase this the right way, as Ambassador Matlock suggested, this is the issue which can go across, from Lviv to Kiev into the southeast. If the government can persuade the people in the southeast that it’s about making the administration, the bureaucracy and the law work for them, then I think we might have a place to start. AMY GOODMAN: Ambassador Matlock, I wanted to get your response to Russian President Putin, aside from saying that he would support the election in Ukraine, said Friday Moscow’s biggest concern over the crisis in Ukraine was that the former Soviet republic would join NATO. He said, “Tomorrow Ukraine may join NATO, while the day after tomorrow parts of the U.S. anti-missile system could be deployed there.” He was speaking to an investment forum. Talk about NATO and Putin and his concerns. JACK MATLOCK: Oh, I think that is and has been Putin’s main concern, and I think that’s why he took Crimea. You know, one of the problems when we started expanding NATO in the way we did is that if we weren’t prepared to stop at a certain point, which had to be Ukraine and, I would add, Georgia, this was going to create a very strong reaction from Russia, whoever the leader of Russia was. And I think it was quite irresponsible, the talk that we had in around 2007, 2008, of bringing Ukraine into NATO, and the fact that the Ukrainian governments were not willing to sort of pledge neutrality, the way, in effect, Finland, for example, has lived as a neutral country without NATO, defending itself very well from Russia. I think this has been probably the crucial issue. There have been others, of course, but I think that’s the crucial one, because Putin looks at the demonstrations in Ukraine inaccurately, but as simply the creation of the United States, the CIA and the West Europeans. And this has been exaggerated in their propaganda, so that the whole so-called threat of NATO putting its bases in Crimea, of all places, was probably the most emotional of the issues that has been driving him. AARON MATÉ: I want to go back to Professor Snyder. Did you see this as a choice between Russia on the one side and then the EU on the other? That was framed as the issue when this revolution began, but why can’t Ukraine forge ties to both? TIMOTHY SNYDER: Because Russia is no longer Russia. Russia is now also an integration project. That’s the big thing that changed, and it surprised elites in the European Union as well as elites in Ukraine, and certainly we are now just coming to terms with it. The traditional Ukrainian foreign policy has been precisely to balance between east and west, to go west as far as you can, then when that doesn’t work out, go back east, and then when that doesn’t work out, go back west. Every Ukrainian president down to Yanukovych, in fact, has done that in one form or another. The reason that that is no longer possible is that Russia is no longer a state. Russia is also an integration process, called Eurasia. And the reason why we had the revolution that we had from November to March of last year and this year is that Russia became an exclusive alternative. What Russia wanted was for Ukraine to join its project, the Eurasian Union, rather than sign a trade deal with the European Union. And so, there we had a clear difference between the Ukrainian president, who decided in the end not to move towards Europe, and the people who started the protests, who were in favor of moving towards Europe. So, Ukraine is no longer in a traditional geopolitical situation where you have a state here and a state here. You have two different projects of integration, right, one of which wants Ukraine to join—that’s Putin’s project—one of which many Ukrainians wish to join, and that is the European Union. So, obviously, some kind of happy middle has to be found. But that’s the reason why—that’s the reason why you can no longer play this game of going back and forth. But I would stress, this is not about fundamentally Russia and the European Union or Russia and America. It’s fundamentally about what the Ukrainians themselves want to do with their own sovereign statehood and the choices that their leaders make. AMY GOODMAN: Professor Matlock—I mean, Ambassador Matlock, the massive China-Russia deal that was just made, can you talk about the significance of that and how that plays in, if it does at all, with Russia and Ukraine? JACK MATLOCK: I’m sorry. I missed the first question. JACK MATLOCK: I mean, first part of your question. AMY GOODMAN: The China-Russia energy deal that has just been sealed, the largest ever. JACK MATLOCK: Oh, the energy deal. I think that that has no relevance at all, except in the minds of some pundits. That’s a deal that will take place several years from now. It’s probably a good thing. It’s going to develop fields that haven’t yet been developed and extend the pipeline, the supply of natural gas to China. That will increase, you might say, the world supply of natural gas. I think that if it makes economic sense—and nobody knows precisely what the terms are—it’s not a bad deal, and I don’t think it should be looked at as if it’s suddenly a switch in alliances. AMY GOODMAN: And, Ambassador—Professor Snyder, that same issue? It’s how the U.S. sees Russia’s alignments these days and the significance of Russia-China together. TIMOTHY SNYDER: I agree with Ambassador Matlock that the deal itself doesn’t have to be seen as a big symbolic event, one way or the other, whether they had signed or whether they hadn’t. I do think that there is the possibility of a Russian geopolitical realignment here, because what’s happened with Ukraine in the last several months is that Russia has defined itself by way of its own propaganda domestically, first of all, but also internationally, as not a European state, as not bound by previous treaties involving European states, as not bound by the general European sense of the rule of law, as not being part of the European postwar order, as not—as, in general, being a different civilization. AMY GOODMAN: We have just lost Timothy Snyder. He was speaking to us from Vienna, Austria. The satellite has gone down. He’s a professor of history at Yale University. But we are going to end the conversation there, though of course continue to follow developments not only in Ukraine, but with the EU, as well as with Russia and China. Professor Snyder wrote Bloodlands: Europe Between Hitler and Stalin. And we’ll link to his piece in The New York Review of Books titled “Ukraine: The Edge of Democracy.” He’s just returned from Kiev. And Ambassador Matlock, thanks so much for being with us, has served as U.S. ambassador to Moscow from ’87 to ’91. JACK MATLOCK: Glad to be with you. AMY GOODMAN: His latest book, Superpower Illusions: How Myths and False Ideologies Led America Astray—and How to Return to Reality, as well as Autopsy on an Empire: The American Ambassador’s Account of the Collapse of the Soviet Union. He also wrote Reagan and Gorbachev: How the Cold War Ended. And that does it for our broadcast on Ukraine. When we come back, we’ll talk about what happened in Santa Barbara this weekend, the massacre. Stay with us.